As your other Monarch mentioned in her recent post about necklaces, I do like a necklace with a leaf motif. Perhaps I'm constantly hankering for spring time, when the trees are green and the world seems alive and vibrant. I also like a leaf motif as it compliments, again as Queen Marie mentioned, my draped dresses and tops and makes everything look Roman or Grecian. My favourite are the two necklaces I bought from Topshop, which I wear together. 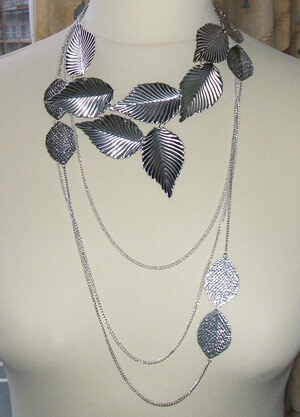 I have been working on my own design for a leaf necklace with some delicate leaf applique I picked up at an art store. It's extremely fine and web like and will be quite tricky to put together, but I shall muddle through no doubt. It's just at the rough layout stage just now, the black dots represent where the stitch would be to hold each leaf to another and will be covered by a black bead. Also in keeping with the whole springtime vibe I'm loving birds too. Not the ubiquitous owl which seemed to appear everywhere, but doves and crows and blackbirds. Camilla Staerk SS06 sent the models marching down the runway with huge black bird necklaces and brooches attached to their ensembles. It was eerie and intriguing all at once, like the scene in Alfred Hitchcock's 'The Birds' where Tipi Hedren is attacked by the black birds. I would love to have one of those massive brooches clinging onto my clothing, it would look intimidating and beautiful - what a perfect combination! 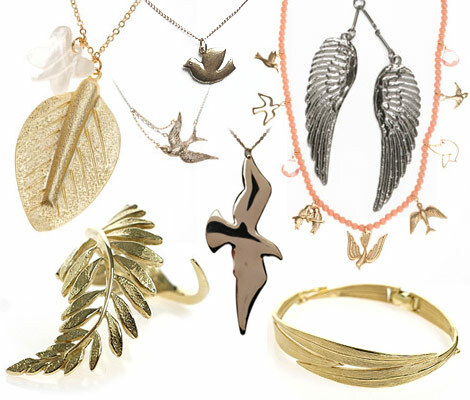 If you fancy getting in tune with spring then here is a selection of leaf and bird jewellery to get you in the mood! Designer Avshalom Gur is another designer who does the birds well. In his AW06 collection he had some beautiful big bird necklaces and belts. They were really stunning. Ooooh yum! I love that they are so huge - size matters! Thanks for sharing this!. 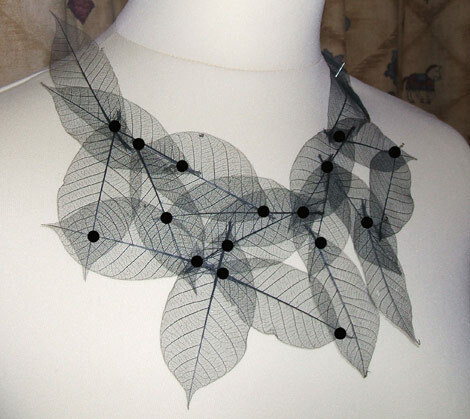 I really need to buy a leaf necklace. I have a pin I put on my handbags but it's just not cutting it...especially after seeing these gorgeous options.